As the middle-aged Marx put it when writing for The New York Tribune in 1859: “There must be something rotten in the very core of a social system which increases its wealth without diminishing its misery.” His understanding of that system identified tendencies towards economic crisis and breakdown as inherent in the normal functioning of capitalism itself. The tweaks and patches improvised to keep things moving become, in due course, sources of turbulence. (How to square stagnating wages with the need for constantly renewed household purchasing power? With more and more consumer credit — plus the chance for investors to wager on securities tied to mortgage failure! That’ll fix it.) These are insights it is unfortunately necessary to recover from time to time. The film opens in 1842 with Marx and his fellow philosopher-journalists at the Rheinische Zeitung being arrested for Marx’s scathing coverage of debates in the local parliament — in particular, his articles on new laws taking away the traditional right of peasants to gather deadwood on a landowner’s property. Marx himself later wrote that reporting on such grubby matters had been his first push towards studying economic issues. On screen, it appears as Marx’s breaking point with the Young Hegelians (not a circle I ever expected to see on film) and the beginning of a series of clashes with government officials and hurried moves from country to country with his wife and children — living the life of an impecunious political exile that continues long after the end of the movie, which coincides with publication of The Communist Manifesto in 1848. For the record, the final scene contains the only significant factual mistake I noticed: Marx tells Engels he will be writing for The New York Tribune, though in fact he was only offered the job in 1851. Now, a film that begins with its hero writing for one newspaper and ends with him taking a position at another newspaper is going to need a lot more than verisimilitude going for it. And that is also true even — or perhaps especially — when intervening developments largely concern the shaping of a political doctrine. What The Young Karl Marx has working to its advantage is that the 1840s were an exceptionally lively decade. Cold War-era accounts sometimes made it sound like Marx was a misanthropic recluse, scribbling diatribes read mostly by other fanatics. Peck stands that myth on its head in the first scene of Karl and Jenny in Paris, attending a political banquet addressed by Pierre-Joseph Proudhon. In short, we get a glimpse at a culture of political debate — the first of several. In later events, the audience consists more and more of working men and women, some of them devoted to Proudhon, others drawn to the religiously-tinged radical vision of Wilhelm Weitling, a German tailor of great eloquence. In time, Marx and Engels find themselves both working and arguing with these comrades, with Marx in particular proving constitutionally incapable of politesse. Of course, he’s even less diplomatic upon meeting a British industrialist who insists that if child labor is abolished, he won’t be able to turn a profit. Textbook boilerplate has it that the Manifesto launched an international revolutionary movement. But The Young Karl Marx shows what that truism leaves out: Marx and Engels were part of, and were shaped by, a movement from below of people who fought not for ideals but for survival. The point of the manifesto was to give that movement an analysis of some breadth and depth. Whatever the failings of Marx and Engels’s shorter-term projections, the lines read in voice-over concern something closer at hand than 19th-century social conditions. 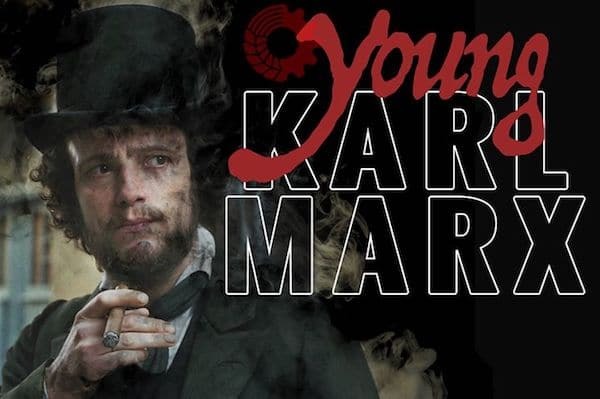 This vision of hybridity applies to The Young Karl Marx itself — a film in German, French and English, directed by a Haitian in a medium well suited to communicating across wide cultural differences. Which brings me back to how in the film, shortly after Marx and Engels meet and begin exchanging ideas, they soon run into police who are hassling immigrants. They try to escape, and the chase is on! I’ve checked the biographies and find no indication that this actually happened. But maybe the director is tipping his hat to American cinema by imagining Marx and Engels in a buddy movie.